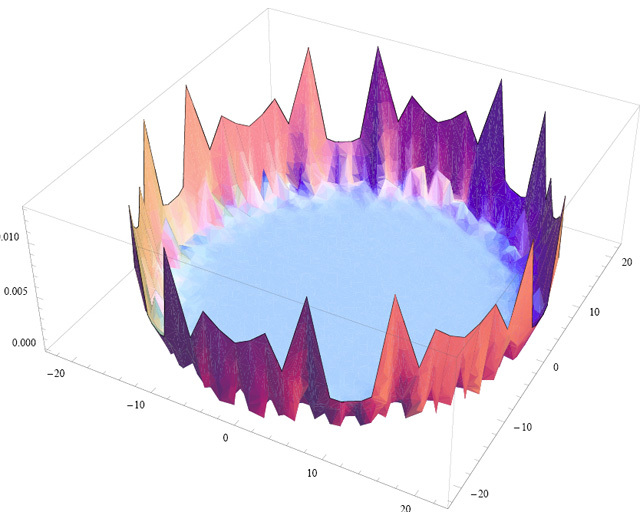 Simulation of atoms at the edge of a TI. Height above the plane represents density of atoms in a particular state. 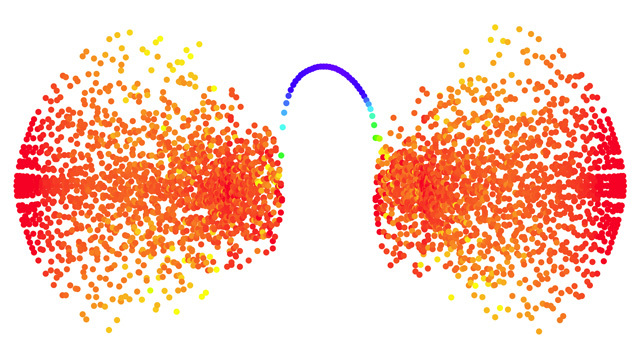 Atoms clustered in conventional bands (orange) with a small number of atoms (blue) in the band gap. Note that the in-gap atoms are on one “side” only, consistent with the chiral edge states they represent. Topological insulators form in certain materials that, in bulk, have the distinctive physical signature of insulators: That is, the permitted energy levels (or “bands”) in their component atomic structures are characterized by a full valence band and an empty conduction band, with a substantial gap of forbidden energies in between. However, at the boundaries with other materials or the vacuum, they develop gapless regions that permit conduction along one-dimensional paths or the edges of two-dimensional surfaces – but in a single direction only. These states are highly promising candidates for use in quantum computation because they are robust in the face of disorder or irregularities. That phenomenon would be extremely difficult to isolate in a conventional condensed-matter system, and direct observation of the edge states would likely be nearly impossible.